Map Collection of Israel (Arnon Medzini) -- An amazing collection of links to a wide variety of maps. Jerusalem in Old Maps and Views (Israel Ministry of Foreign Affairs) -- "The Land of Israel and its capital city, Jerusalem, boast the longest unbroken succession of maps of any country in the world. Through a choice selection of maps, this exhibition presents the cartographic history of the city which King David established as his capital 3000 years ago. The exhibition comprises maps and views of both the city itself and the land of which it constitutes the heart and soul." Very well done. maps, text overviews, images and more. 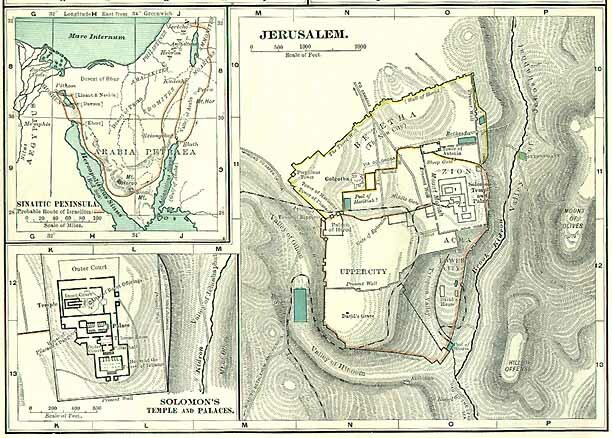 Jerusalem (Britannica) -- Article, contemporary map and links. Ancient Jerusalem (utexas) -- Map (356K). 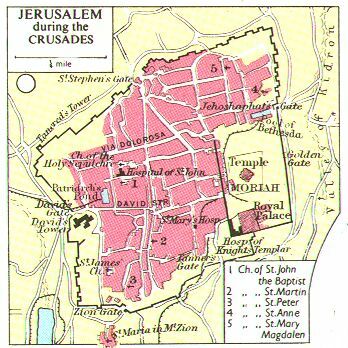 Jerusalem during the Crusades (Medieval Sourcebook) -- Map. Virtual Jerusalem -- A variety of resources. Fellow of the American Geographic Society, Etc. Published by The Century Co., New York, 1900.